Dennis Rd pupils, 1954 my first year class, in the annexe (wooden hut) Mr Warrens class. I am in the middle of the front row, with the blonde hair. Does anyone recognise anybody in this group?? Malc. Every day is a gift, that's why they call it the present. 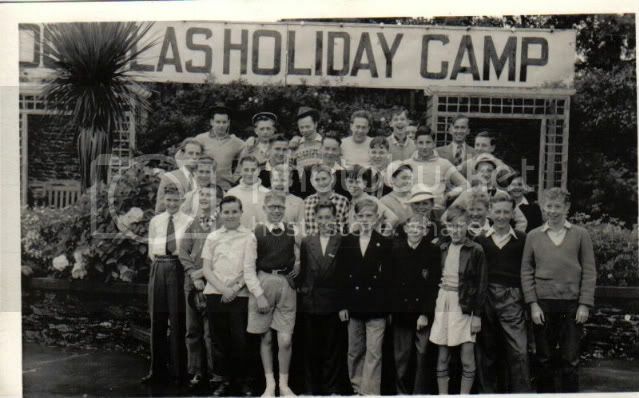 This is a photo of Dennis Rd lads at the Douglas Holiday Camp Isle of Man. This is a different year to the one shown elsewhere. Some lads are on both. You may recognise your mates, or at least, remember some of the faces, can you name any?? I know of some. There are a lot of faces that i recognise but have forgotton the names, i am top row 6th from the left. Graham Webb was born on 13 January 1944, as the youngest of five children brought up by a war widow in a slum in Birmingham, England. He was given the last rites twice as a child before gaining his health. He got his first bike when he was eight and soon enjoyed going not only on long rides, but rides of such length that they were beyond him. He began riding from Birmingham to Gloucester and back, just because it was a magical 100-mile (160 km) round trip, and persisted until he could do it without literally falling into a ditch from exhaustion. He succeeded 'non-stop' only on his third attempt. "I just enjoyed doing it," he said. "I enjoyed suffering, I suppose. I still do." This is photo taken the following year. I am confused, you say the photo I posted must have been the year before you went, however you say on your other reply that you are 6th from left, and indeed you are, so you must have gone both these years?? The picture you posted was the other one I refered to, been on other sites. By the way, I am the one in the hat in the first photo. The females in the pictures, were teachers wives. We found our own crumpet, well I did, anyway, Still remember her name and address after all these years She was a pretty blonde girl with a pony tail Malc. Elan Valley?? Isle Of Man??? You Balsall Heath kids were spoiled! All we got in Small Heath was a trip to the bluebell woods at Alvechurch! Those of us that were in the scouts, got to go to summer camp for a fortnight too, in Wales. I guess it gave our parents a break from us. Malc. Page created in 0.21 seconds with 18 queries.